The Hell & Heaven Metal Fest that was scheduled to take place in Feria De Texcoco, Mexico on Saturday, March 15th with headliners KISS, GUNS N’ ROSES, KORN, TWISTED SISTER, ROB ZOMBIE and LAMB OF GOD has been cancelled by the Mexican government. 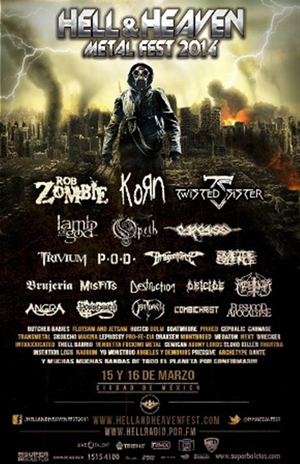 “The Mexico state government says the March 15th-16th Hell And Heaven Metal Fest concert planned for a fairground just east of Mexico City did not have adequate safety plans, posing a risk to concert-goers. The web pages of all three of the metal bands still showed the concert on their tour schedules. The state sent about 300 riot police to surround the fairgrounds Friday in the township of Texcoco. The state civil defense office, and its federal counterpart, said in a statement that it had cancelled the organizers’ plans ‘for 70,000 to 80,000 people and 50 musical groups, because safety conditions for potential concert-goers were not ensured.’ It cited a lack of fire safety and evacuation plans, and inadequate planning for fireworks. The town of Texcoco is governed by the leftist Citizens’ Movement party and still supports the Metal Fest. Town spokesman Francisco Vazquez said he believes the state government, which is in the hands of the ruling Institutional Revolutionary Party, may have cancelled the concert for political reasons.